This recipe came from my parents' neighbour years ago, and my dad has been making it ever since. 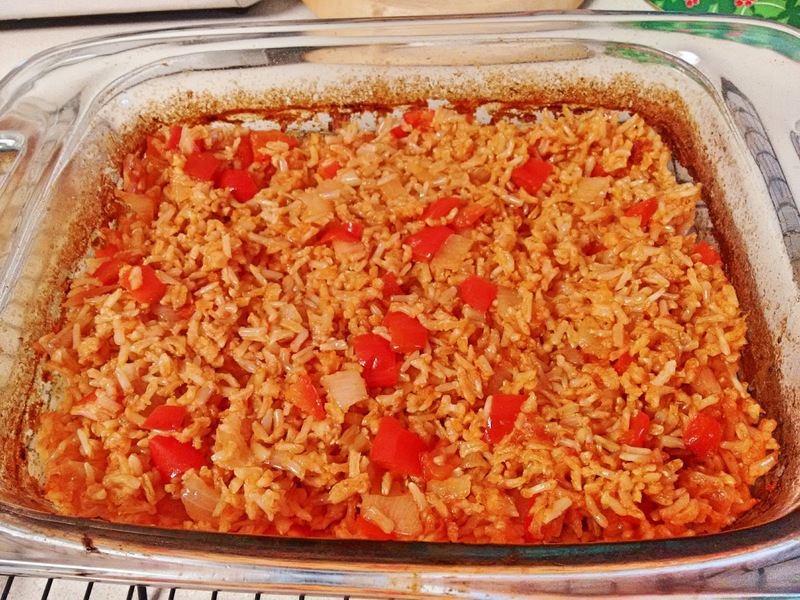 The version my dad makes has frozen peas in it, but peas are not well-liked in our house, so I swapped them out for a red bell pepper instead, which also worked well with the tomato-based flavour and the extended cooking time. The bell pepper also adds potassium, which helps offset the sodium content from the broth. This dish reheats very well, so you can make a large batch and enjoy the leftovers for a couple days. To make this dish vegetarian, use vegetable broth instead of chicken broth. "No Salt Added" varieties of broth have a significantly lower sodium content than even the "Low Sodium" varieties do, so be sure to read labels carefully before buying. You can also use homemade broth made in a slow cooker. Preheat oven to 350°F. 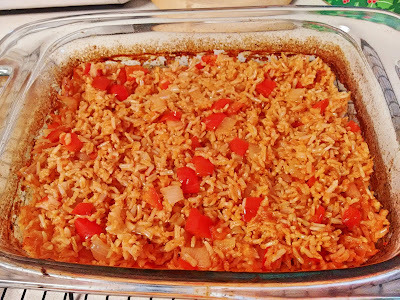 Pour rice, broth, tomato paste, olive oil, onion and salt into a large (2L or 2 quart) glass casserole dish with a lid. Stir all ingredients together, cover with lid, and place in oven. Remove dish from oven every 30 minutes to stir. Rice will absorb liquid throughout cooking time, so liquid will be gone and rice will be slighty crispy around the edges of the dish. Total time in oven will be 1h30 to 1h35.